This obscure West Coast 45 appears to have been the only record ever cut by the equally well-hidden Mr McDade – but it is a real goodie. He has an engaging light baritone voice, with just the right touch of harshness when required, a good sense of timing, with that Otis Redding influence made quite clear. Tears on my pillow isn’t the Little Anthony classic but a finely structured gospel chorded ballad, featuring some neat piano and a full horn section courtesy of veteran producer/arranger Miles Grayson. I could listen to discs like this all day. I guess this came out around 66/67 as the flip is a version of Otis’ “Fa-fa-fa-fa-fa-fa (sad song)”. A nice little irony this as of course when Jim Stewart and Estelle Axton started up their record company in Memphis, Satellite was the name they chose, until a clash with another concern forced them to change it to Stax. 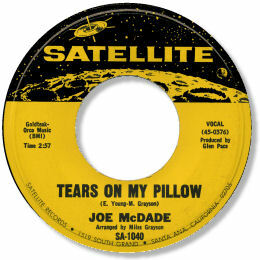 And now here’s Joe on yet another Satellite covering Stax’s key hitmaker.